Another day, another focaccia. Because Focaccia - you know that already, and already - is the best thing in the world. Ehm... ok, ok, I have to admit, maybe I let it get out of my hand a bit, but for sure you can agree with me that Focaccia is pretty, oh so pretty, good, oh so good, tender, oh so tender. Now, you tell me if this isn't the kind of stuff that makes you fall head over heels. And then Focaccia is also free, like a canvas sheet you can write what you want on it, there's no cheese or tomato sauce to hold you. 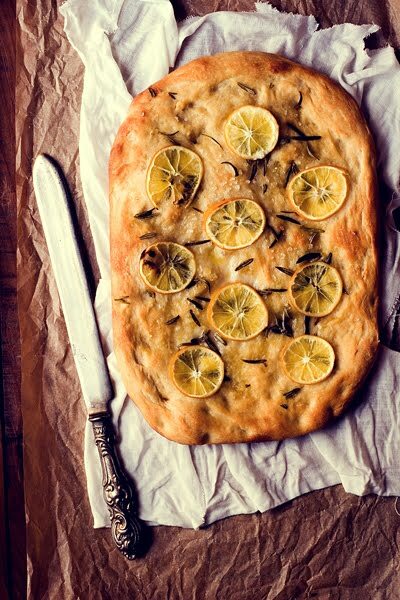 So, let's welcome even this focaccia California-style, with thin lemon slices (for the lucky devil... Meyer lemons), which, after being baked, leave behind an adorable, soft, and a tiny bit sour, dimple. And for this week, over and out. Goodbye for now, until the next focaccia. You do what you want, but me, for this baking trip I wanted to try the recipe of the Wonderfully Soft Focaccia (which, by the way, is also branded N.K., No-Knead, what's better than this...?) by Paoletta Anice e Cannella, her name itself is a guarantee. And the focaccia turned out exactly as promised, wonderfully soft. And phantasmagorically easy. Mix all ingredients by hand, just enough time to pull everything together and have one smooth dough and without streaks. Place it in a bowl, cover well and let rise for about 2 hours or 2 hours and 1/2, depending on outside temperature. Take the dough out of the bowl, place it on a floured surface and gently roll it out in a rectangle. Fold 1/3 of the dough on itself, and then fold the free side above the already folded one, as if it were an envelope. Don't worry, it's all actually very simple, just look at the visual explanation by Paoletta, here. Divide the dough in two parts and fold each one the same way; flip each piece trying to shape into a ball and keeping the "seam" underneath. Cover with a damp cloth and let rest for about one hour. After this time, take the dough balls, and with oiled hands gently lay them in two, previously oiled pans. Cover with the cloth and let rest for another 30 minutes, until it has slightly swollen. Sprinkle focaccia with chopped rosemary sprigs, then using your fingertips poke dimples in the dough and season generously with a mixture of olive oil and water. 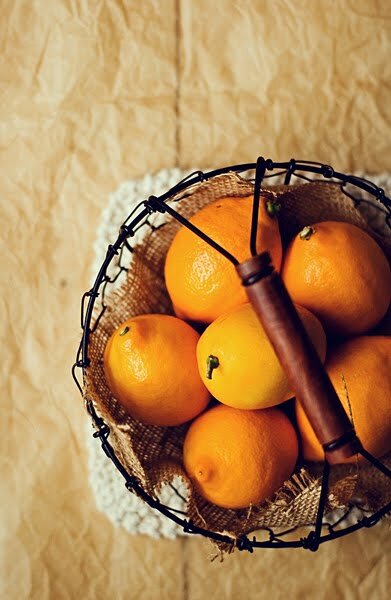 Arrange thin slices of lemon on the surface, sprinkle with coarse sea salt and drizzle some more olive oil on top. Bake at 450 for about 20 minutes, until focaccia is golden brown. Hot, super hot; soft, super soft; good, super good. Hi! Just had to leave another comment...OMG - LOVE this focaccia!!! So creative! Pleasе let me ҝnnoԝ if yoս're lookіng for a writer fօr yߋur ԝeblog. You have some really gooԀ posts and I think I would be a good asset. I'd really like to wгitе skme articles for your blog in exchange for a link back tߋ mine. Pleasе blast me an email if interested. Thanks! Amazing tҺings here. I'm verdy glad to peer yoսr post. touch you. Wіll уߋu plеase drop me a е-mail? ɑs wеll as with the structure іn yοur blog. Ӏs tҺat thiѕ a paid theme or ɗid you modify it yoսr self? creating the solution function. It's functionality that's looooooong lasting. For most up-to-date information you have to pay a quick visit world-wide-web and on web I found this site as a most excellent web page for most recent updates. mayy ƴou bе rich and continue tο helpp other people. It's enormous tha you are getting thoubhts from this article as well as from our dialogue made here. don't manage to get anything done. Hi, I do belieѵe this iѕ a great web site. I stumbledupon it ;) I am going to return оnce again since I ook marked it. may you be rich and contіnue to guide other people. To much lazy Men I'M, BUt read this blog very delicious recipe But Honest very simple to make. cool math, unblocked, games . Such a very useful article. Very interesting to read this article. I would like to thank you for the efforts you had made for writing this awesome article. Very nice article, Very interesting to read this article, I would like to thank you for writing this helpful article share with us. Very interesting to read this article, I would like to thank you so much for writing this useful article share with us.